We have far greater power than we often realize. 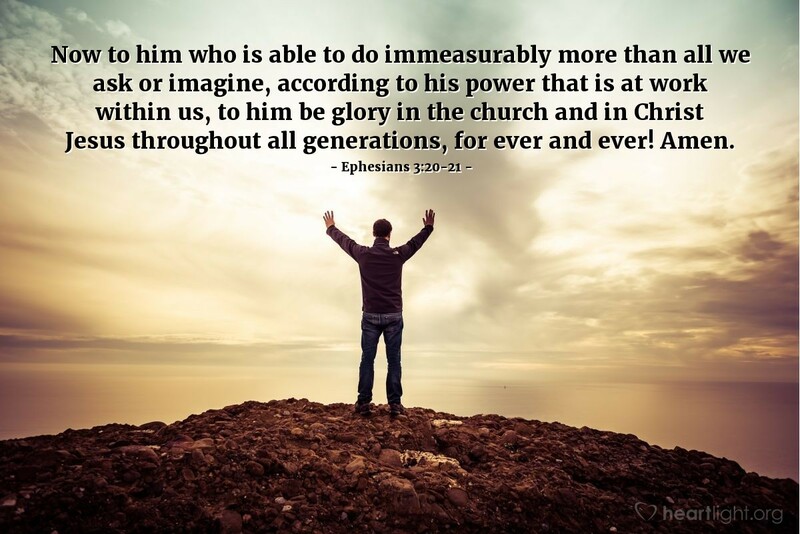 That incredible power is at work within us (see Ephesians 1:18-19). This promise of power, however, is tied to two opportunities God gives us daily. First, it is based on actively asking for God to do great things based upon a holy charged imagination. Second, it is based on our living to bring God glory. So let's ask, imagine, and give God glory; then let's praise him for doing far greater things than what we ask or even imagine! Dear Father in heaven, forgive me for my pedestrian dreams, my selfish prayers, and my short-sighted goals. Awaken my heart to your will and open my eyes to your plans by the power of your Holy Spirit. As you do this, dear Father, please do it to your glory and praise. In Jesus' name I ask this. Amen.